StumbleUpon is saying bye bye to the green and blue logo we are all familiar with and have introduced a new orange logo. Not only did they go through a logo change, but the entire site has been redesigned. The update was just rolled out today. 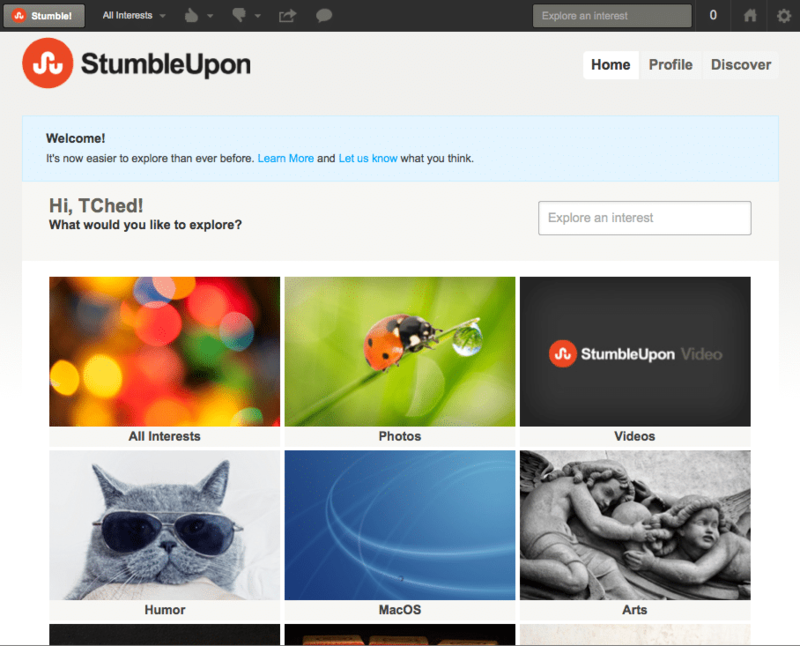 New StumbleUpon bar – The bar has fewer buttons and a cleaner look. The bar now includes the Stumble button, voting buttons, simple share as well as the new Explore Box the company introduced back in August. Stumble Channels – There are currently over 250 channels and that give users a way to directly explore content from sites, celebrities and brands. Do you use StumbleUpon to discover new content? If so, what do you think of the new redesign? StumbleUpon is testing out a new feature called the “Explore Box”, which allows you to type in keywords related to your interests and the box displays stumbles related to your keyword. The feature is currently in testing mode with a few select users, but if it does well among those testing it now, we could see it before too long. The search box isn’t to be used like a search engine obviously, but rather to help you find interesting things related to the key words you typed in. The use of the Explore Box will expand a users StumbleUpon experience and can really help you narrow down a search for a particular topic that interests you. 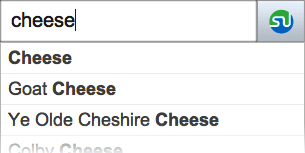 If this feature does roll out, using keywords while stumbling articles will be more important than ever. Do you use StumbleUpon and do you think this added feature could be beneficial for users? 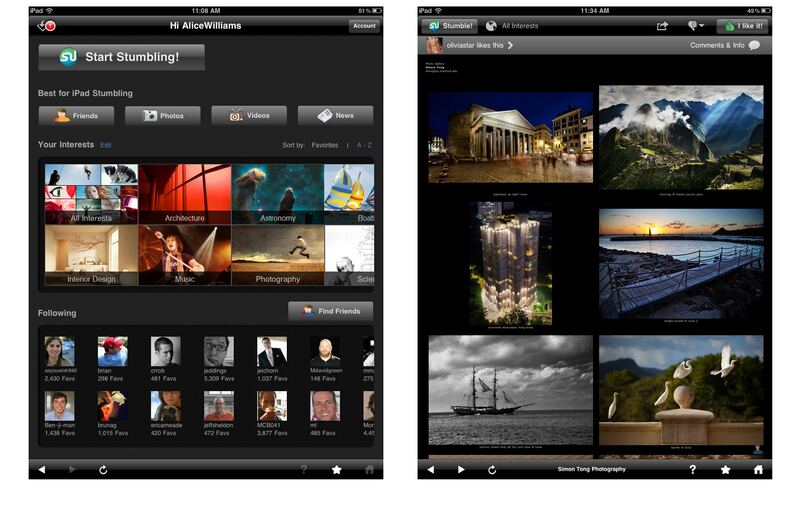 StumbleUpon has revamped their iPad app. They added a new interface which makes it even more appealing and easier than ever to share your finds with your friends, as well as check out what they are currently interested in. As you can see in the picture on the left, you can start stumbling directly from the app’s home page by swiping the screen or tapping the “Start Stumbling” bar. The picture on the right shows how you can see what others like and may have commented on. StumbleUpon has even made this handy video which shows the app in action. If you have the old app, know that it won’t be updated automatically. You’ll have to install the new version from the iTunes store. They promise it will be worth the few seconds it takes to install the new one! StumbleUpon wants to know “Have you ever thought to yourself, man, I’ve got some pretty awesome taste in stuff?”. Why yes, yes I have. If you have as well, then you’ll be happy to hear about the new widget they have launched. Your friends have been able to follow your favorites on StumbleUpon and now, we can all share our favorites on a broader scale. By using the Widget Creator, you can insert one line of code into your blog or website that includes either your favorites or sites that are rated the highest within an interest and/or domain. You can choose from three different sizes including square-ish (300×250), wide rectangle (600×250) and tall rectangle (160×600). Let’s say you have several domains and you would like to cross promote. The new Widget Creator would allow you to do that. And as Mashable points out, this could also be used as a more polished version of a blogroll. Will you add the new StumbleUpon Widget to your site? Are there other ways you could see it being used? StumbleUpon is the ultimate time waster (and I mean that in a good way!). If you don’t have the toolbar installed, I suggest you do so – it’s your portal to lots of amazing things on the Internet that you’d never find otherwise. You just set your parameters and hit the Stumble button…be warned that it’s easy to spend hours surfing this way. If you have a hit on StumbleUpon, you can bring in thousands of new visitors – and while traffic does spike, it also continues over time as long as people keep giving you the thumbs up of approval (like a Facebook “like”). Be warned, though – the user’s mouse usually hovers on the Stumble button, so if you don’t catch their attention quickly, they’ll be on to the next random page on the Internet. Today’s articles talk about how to best use StumbleUpon to not just see that traffic spike, but also keep people reading. I’m always a little wary of “definitive” guides, but this post is as close to one as you can be in an ever-changing digital world. If you’ve new to StumbleUpon, start here. If you’d a user wanting to optimize how you browse with StumbleUpon, start here. If you want to build your traffic using StumbleUpon, start. In other words, Glen is brilliant, and you should start your StumbleUpon education here. You can follow Glen on Twitter @viperchill. You don’ t have to convince me that Kristi Hines is a Brilliant Blogger. This post covers the ins and outs of StumbleUpon etiquette, a topic that is important no matter what new media tool you’re using. It’s just one of the many great resources on Kikolani! Follow Kristi on Twitter @kikolani. Like the other two posts I’ve featured this week, Garrett’s StumbleUpon post is a wealth of resources. He gives us tips on marketing, tips on advertising, links to others’ StumbleUpon experiences, and lots more. It’s an awesome resource, and maybe my favorite of the week! Don’t forget to follow Garrett on Twitter @garrettfrench after you’re done reading his post! Did I miss your post or a post by someone you know about StumbleUpon? Unintentional! Help me out by leaving a comment below with the link! Blogging: Not Just For The Young! Not only am I a blogger, I’ve BEEN a blogger since April 2004; I’m no newcomer! If I may say so, I know whassup with the Blogosphere. I have several hundred blogs in my blogrolls and readers. Not only do I blog for myself, I blog for several clients as well. I read everything I can find about blogging, the Blogosphere, Blog Conferences, and blogs in general, and while it is true that many bloggers are between 18 and 35, I will have to stand up and challenge anyone who claims that the Blogosphere is inhabited mostly by the young. I know for a FACT that there are Blogosphere neighbors who are, shall we say, more than just a little bit to the right of the age timeline median mark. I know this because, not only am I one myself, I know of definite OTHERS! I’ve blogged with them, commented with them, MET them in Los Angeles and Chicago at BlogHer, talked with them on Skype and Google Chat and even the (remember this?) telephone! We’re on FaceBook and MySpace together, and we often exchange ideas on Linkedin and Twitter. We Digg and Stumbleupon and Reddit, and we think social media is absolutely del.cio.us. Some of us even know about (shhhh) Bit Torrent. Yes, the Blogosphere is filled with young parents, and young entrepreneurs, all sharing advice and information, but that same Blogosphere is also filled with older people whose children are grown and gone, and whose businesses are thriving, or were thriving – or not – who can offer invaluable advice to young parents and others who are now where older bloggers once were. The Blogosphere, like any neighborhood, is teeming with people who know, and people who need to know! Online, we come together. Online, we can meet and help each other in ways that just aren’t possible in our “other” lives. No matter where we fall, chronologically, we all love to meet each other, and blog expos and blog conferences are some of our favorite things! We older bloggers are not interested in Geritol, Assisted Living ads, denture adhesive, insurance, orthopoedic shoes, funeral directives, Depends, bland diets, and articles on how to entertain grandchildren. I mean, we ARE, but mostly, we’re not. Please, marketers, do not insult us with such assumptions or stereotyping! Older bloggers are interested in the same Blogosphere “things” as everyone else: where to find deals on SD cards, funky forums, movies, books, laptops, HDTV, wireless digital picture frames, new cars, WordCamps, Amazon, eBay, cool recipes, blog conferences ( a huge percentage of BlogHer participants were over 40! ), cool electronics, fashion, the environment, crafts, education, and humor! Blogs, blogging, blog conferences, and the Blogosphere itself are not inhabited by one age group only. Like any interesting neighborhood, the Blogosphere has neighbors of all ages, ethnicities, backgrounds, personalities, and temperaments. The important thing is, to be a part of that Blogosphere! There is definitely something for everybody there.